At the Society, we believe that strategic collaboration is key to advancing our mission. 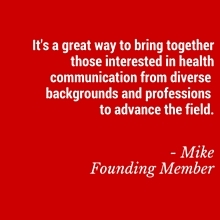 By bringing together complementary skill sets and diverse resources, we can have a greater impact on the field of health communication. We are actively seeking opportunities to build meaningful partnerships with like-minded organizations that share our values. We consider partnerships with organizations across all sectors around topics or activities that leverage communications for health and social change. If you’re interested in partnering with the Society, please contact Erin Norvell at [email protected].